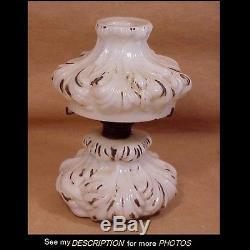 Antique Miniature GWTW Milk Glass Plume Kerosene Oil Lamp Gone With The Wind Milk Glass in the Plume Pattern Miniature Gone with the Wind Lamp. Lamp is shown on page 107 Figure 203 in the book Miniature Lamps by Frank & Ruth Smith Milk glass with gold accents in the Plume pattern. Burner is marked but I cannot make it out. Original Burner with shade support. The Lamp does not have its glass Chimney. Measures 7-1/4H to the top of the Shade. As stated chimney is missing. Via UPS within the U.
I Sell mostly Antique and Vintage Items and it is impossible to describe all imperfections, scratches, scuffs, etc... Items with age typically display patina along with signs of use. Be sure to view all the photos we take the time to process and display in a clear large format. The item "Antique Miniature GWTW Milk Glass Plume Kerosene Oil Lamp Gone With The Wind" is in sale since Friday, February 6, 2015. This item is in the category "Collectibles\Lamps, Lighting\Lamps\ Non-Electric\Miniature". The seller is "rjb670" and is located in Bristol, Connecticut. This item can be shipped to North, South, or Latin America, all countries in Europe, all countries in continental Asia.